Once They Were Almost Human! 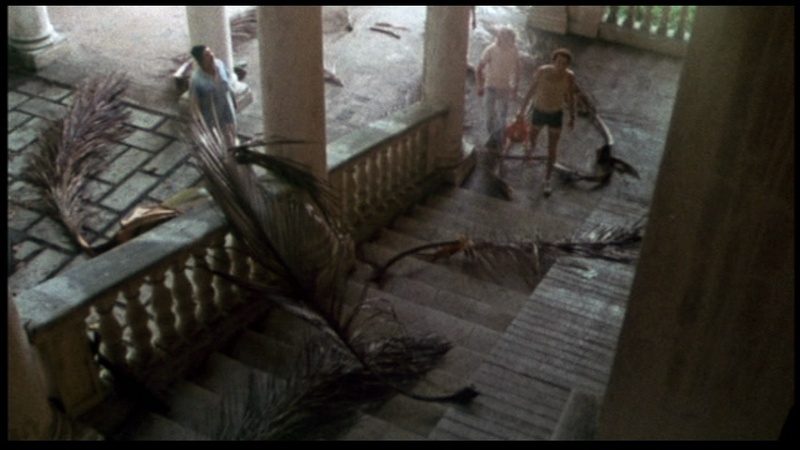 Since we’re already with the subject of zombies why not tackling a subgenre of this subgenre in horror movies? Oh yes, that kind of thing definitely exists. And who would have thought that Nazi zombies would become so popular? 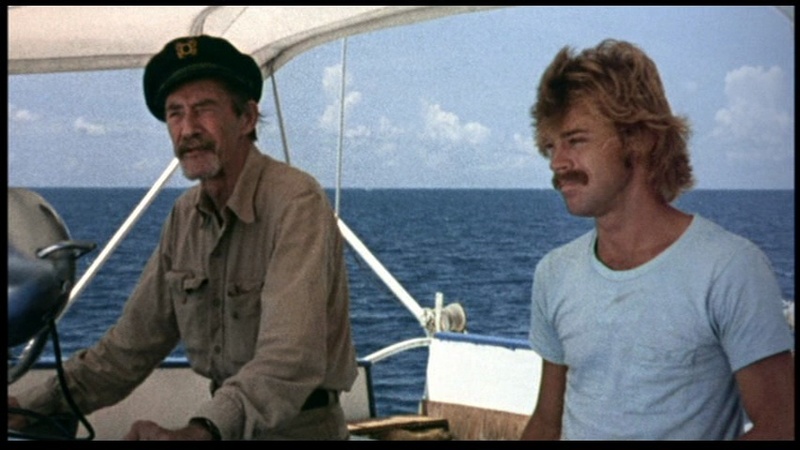 Amazingly enough, what seemed like a cheap gimmick has survived over many years, spawning utter garbage such as Zombie Lake to remarkable recent films like Outpost. 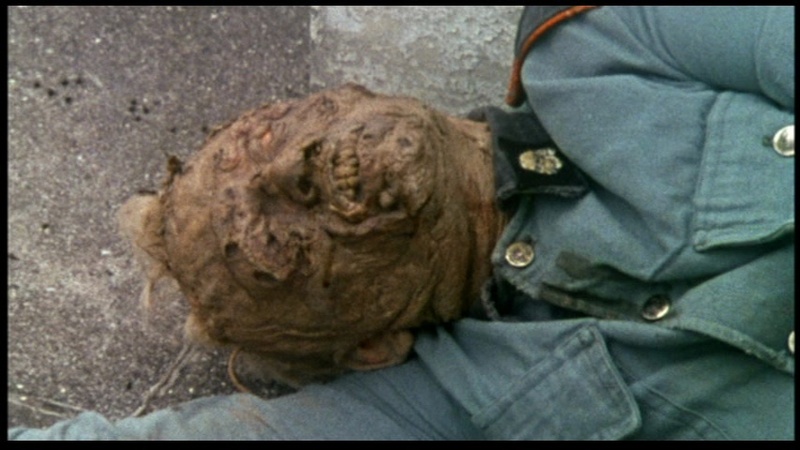 However, the roots of this unlikely genre can be traced to one movie, THE Nazi zombies romp: Shock Waves from 1976, which is one of those films that you have to experience for yourself to understand what the fuzz is all about. I’m sure there must have been other movies before this one dealing with the difficult subject matter with varying degree of results, but certainly none with this remarkable effectiveness. Never Nazi zombies made more sense or even felt logical as in Shock Waves – in fact, you could say it singlehandedly kickstarted the subgenre, for better or worse. On paper the whole deal sounds fairly average: group of tourists end stranded on seemingly deserted island, WWII German outcast must guard a Nazi experiment gone awfully wrong involving living dead German soldiers, and of course chaos ensues when the tourists meet the zombies. Yet the movie itself captures your attention from the very first moment with a moody introduction about a WWII legend and it doesn’t let it go until it’s all over. Maybe it’s the adequately scripted pace, providing equal doses of mystery and terror, the enigmatic island, or maybe it’s just the convincing characters, or perhaps the oddly compelling soundtrack… I can’t put my finger exactly on what makes this movie tick but it all works beautifully. 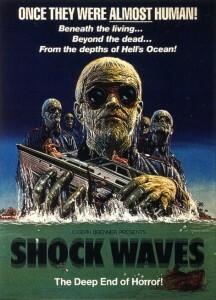 Put simply, Shock Waves boasts a weird atmosphere that will haunt you for entire days and you can quote me on that. 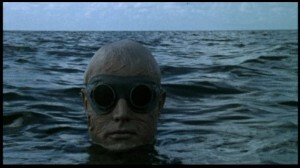 It’s a shame therefore that Shock Waves was basically produced by a group of strangers who could never quite repeat the feast. 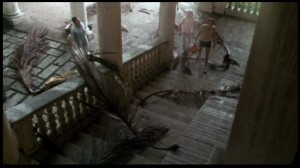 The director, Ken Wiederhorn, remains virtually unknown except for this one movie. He later teamed up with Ron Kurz (who co-scripted the first Friday The 13th and wrote the second one no less) to produce Eyes Of A Stranger, which was an acceptable horror movie to say the least. However, he also directed an Animal House ripoff called King Frat (ugh), Meatballs 2 (UGH!) 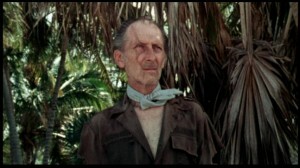 but the sequel to Return Of The Living Dead as well, so I guess the man is even. 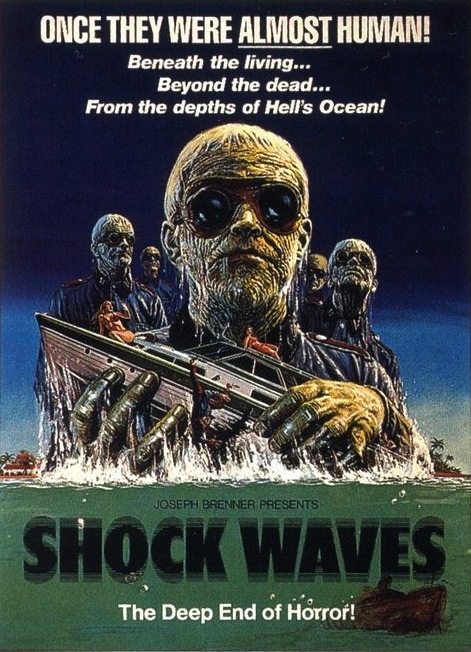 It’s worth mentioning that Shock Waves casts Peter Cushing as the WWII madman in one of his last performances and John Carradine a cocky boat captain. Need I say more? This remains one of my most favorite horror movies and I was never sure why. It’s not like I’m embarrassed or something because Shock Waves decidedly has its strengths but it still is, after all, a by the book affair. For some reason though it struck a deep chord in me and I always come back at least twice a year to re-experience it. I know I’m not the only one either since many have been obsessed with this movie as well. Some magic chemistry was certainly at work here – it’s all just too strangely captivating and I can only urge you to confirm this by yourself. Shock Waves can be acquired by the good people at Blue Underground. Well said, seems none of us can put our finger on it, I know the musical score is a big plus.